Slide box: The basis is a wrap around box of thick aluminium plates enclosing the beam. Each of the 4 plates has a unique function. The top and bottom plates are for the absolute location of the slide box; Turcite blocks for the heavy downward loads and vibration damping, ball bearing rollers only for lateral location. One vertical sideplate supports the entire drive mechanism – see picture. The drive motor sits over the top of the slide box and drives the big pulley on the outside. All the rest is inside the web of the RSJ ending up with the toothed belt driving onto the rack with a caterpillar drive to give more tooth contact. This plate is at the back of the machine and also supports a pair of Desoutter AFDK drills which just need a pulse from a 4mm air pipe to set them off on an automatic drilling excursion. The other side plate supports a swinging plate that holds a pair of angled router motors. These are alternately selected with a push from an air cylinder; the cheapest alternative to a tool changer you’ll ever see. The tool changer: The top pivot point is in line with each router motor axis so that they both swing into exactly the same position. The pneumatic pusher cylinder is mounted inside the slide box and pushes a peg that goes through a slot – neat huh? Between the motors a round steel plug is pressed into the plate and one of a pair of electromagnets pulls this to lock the plates together (better solutions in comments please). So there we have a heavy duty industrial quality router with 2 tools and 2 drills; about £20,000 worth if you had to buy one. One could earn a comfortable living with one of these. Not a lightweight project but still DIYable. Don’t get bogged down with cutting, welding and drilling heavy frames; the steel suppliers have all that kit and will make your frame in no time. Just send off your drawings and wait for your cnc router to arrive. Levelling the beam: There must be a few ways to do this other than sending it away for precision grinding. A small steel block with a laser on it will show a dot moving up and down a target to reveal the bumps which will respond to a light touch of an engineers scraper. When the beam is true adding hardened steel guide bars will provide the perfect flat finish. Panels: Professional machines come with expensive steel panels. As the central box chassis needs to be stiff and straight use MDF panels bolted to the steel to make it neat and strong too. Hammerite paint on MDF is remarkably durable and will keep it all looking very tidy. 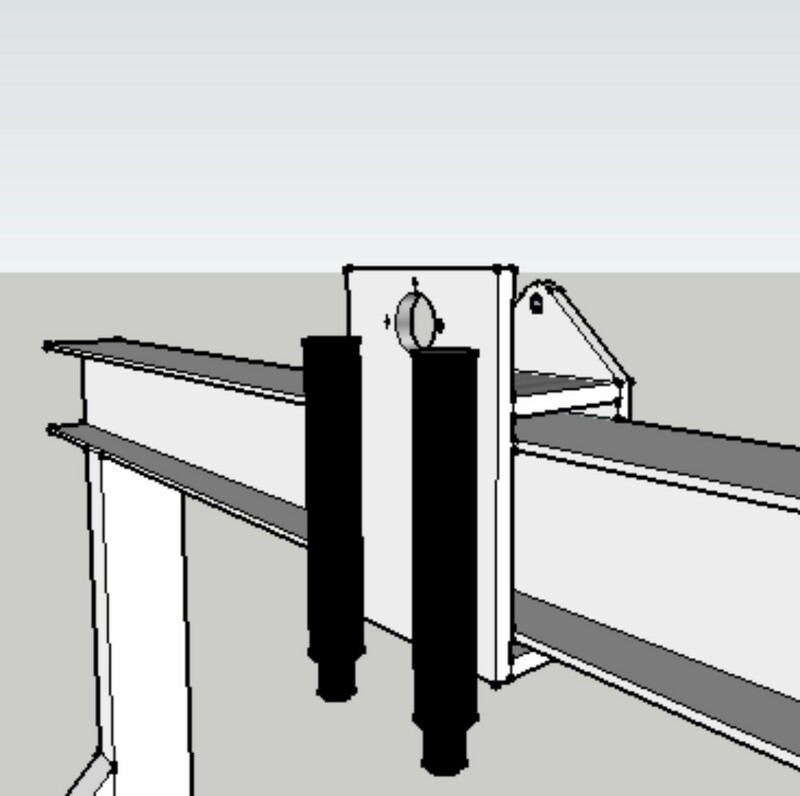 Bellows: With a rectangular box sliding on the RSJ there will be no problem in adding bellows to make the machine the ultimate in tidiness and this will be no bad thing for the unlubricated Turcite slides. For further reading try following http://www.mycncuk.com -a fount of CNC knowledge- and please criticise or add ideas for improvements in comments. Driving both sides of a wide gantry present some awkward problems. Coupled long ball screws are expensive and prone to whipping and synchronised stepper motors on each end don’t always step in time and crabbing can occur. The caterpillar drive shown here (top left) for the slide box on the X-axis is intended to enable a timing belt to engage with a rack with the arrangement incorporating a low cost reduction drive. The X-axis beam is supported by a slide box on each end and each one contains the caterpillar drive (top right). A single drive shaft, with a pulley on each end, pulls the slide boxes up and down the Y axis via long timing belts. The drive boxes contain reduction drives which finally engage with a rack. We call them caterpillar drives because the drive belt engages with the rack just like a tractor laying its track on the ground. Note that the pull on the belt is in the same direction that the slide box moves and that there is a differential action with the belt moving much faster. With a couple more pulleys the main drive belt at the top can be brought down to run under the red drive pulley and just above the lower run. Thus the belt can be made to lie, and slide along a slippery nylon bed rather than flap in the air. Cheap computers and software have brought CNC machining within the realms of DIY. Some smaller routers are not much more than toys but for a machine that can commercially earn its keep we need some size and the ability to hang more tools. So here we have something much bigger and heavier without increasing the cost to anything like a professionally made router. Size: In order to machine round the outside of a standard 8’x4’ sheet we’ll need a long and strong X-axis. A heavy steel RSJ will resist the tendency to sag under the weight of two 4.5kW router motors and two drills. Of course a machine that holds multiple tools is ultra productive but also very expensive; usually that is. Torsional rigidity is not a strong point but is easily enhanced by welding a heavy tube inside one of the webs. Steel can pick up vibration so filling the tube with heavy chain and oil will make a cheap but effective damper. You only get really smooth finishes on a machine that is well damped. Z axis: You could buy an off the shelf Z slide and hang that off the X axis for a conventional and simple layout but the logic of that is debatable. When machining flat boards etc there is very little Z movement so it would be better to put the Z under the table so that the two major movements – X and Y – are as light as possible. The Z frame (the whole bed) is raised like a garage car lift with 4 chassis mounted screw posts rotating to drive ball nuts on the frame. Unlike the continuous chain of the garage hoist a short timing belt for each screw connects to one of a pair of drive spindles which are both driven by a central belt and the stepper motor. This way we get reduced belt stretch and a built in reduction drive. This layout enables a much bigger Z travel – 3D modelers note – and makes a fast and responsive machine with a tidy uncluttered look. Air balancing means there would be no heavy lifting for the Z stepper motor. This unusual configuration has a lot of advantages. The sketch above doesn’t show the tractor drives or the box slides (one for the tool head and 2 to hold up the X-axis beam) which are described in detail here. The rear mounted drive shaft drives the two differential caterpillar drives that power the Y-axis. Panels: MDF – easy to cut, cheap, noise suppressing and remarkably robust when painted with Hammerite. Weight: Chassis needs heavy welding skills and reasonable accuracy. Z-axis: Quite elaborate 4 pillar lift mechanism with guides. Size: Scaleable to industrial size. Pictured as 2m x 4m here. Visibility: Whole work table visible without moving obstructions like gantry legs. Safety: Work table has no sideways movement. No pinning accidents. Space saving: No sideways movement of table so roughly half the footprint. Convenient: Router motors present themselves right to the edge of the table. Accurate: Very solid construction gives accuracy and good machining finish. Neat: Hollow beams accommodate wires, lights and control panels. Responsive: Weight of Z-axis is removed from the X and Y axes. Large Z-axis: Big range possible – good for carving. Short Y-axis: Single stepper motor drives both ends of X-axis beam so no crabbing. …. and isn’t it the neatest CNC router ever? Aircraft grade birch plywood stuck onto an aluminium sheet has been CNC machined away to leave struts for load distribution and pockets for plug inserts. Loads are distributed by the remaining integral struts. A mirror image version will then be glued on top –wood to wood- and the outside aluminium edges peened over to leave a solid looking panel (but largely hollow inside) which will not only look good with complex curves but be very strong and light. Any big holes in the panel will have the edges peened over too. Peening can be largely automated with a CNC guided rotating roller head. Heavy loads from components bolted to the panel are fed in via plugs inserted into machined pockets so that any through bolts can’t crush the wood structure when tightened. The plugs are fitted in pairs with a larger star washer in between so that the sharp edges crush into the plywood to give even more load transmission. Being CNC machined, identical complex panels can be produced quickly and with minimal labour cost. It pays dividends to design complexity out of the car and into the panels. Padded leather panels, a headrest for example, can easily be bolted up to the bulkhead as can other trim items. Front and rear bulkheads in our car will be connected by 3 aluminium tubes. They will be joined to the bulkheads by cast ally brackets where the tube end is expanded and glued by a tapered collar pressed into each end. The picture here shows how a side panel wraps the tube to make an immensely strong beam affording maximum side impact protection and, of course, a nice wide arm rest as well. The folding is achieved by machining ‘V’ grooves through the plywood leaving the aluminium skin to be a bent hinge line. A more complex shape to the groove can make rounder corners too. The inspiration for much of this comes from two great car designers. Colin Chapman made racing car bulkheads from opposed metal sheets with peened holes and edges for rigidity. Alec Issigonis with his Morris Minor design used a complex bulkhead to mount suspension, shock absorbers, steering rack, battery box, pedals and more. We shall do the same. No doubt the car will be strong, stiff and light but there is more to an eco-car than that; it must come at an affordable price and these techniques get us there all in one hit. In fact the car is so simple that anyone with a modest workshop and access to a CNC router could make one. Maybe a good base for a schools project? Ultra strong and light complex panels like these will have many other uses. Paired frames for a motorcycle and a gyrocopter immediately spring to mind. In higher volume applications the plywood core can be precut with a waterjet cutter and then glued between the precut aluminium sheets.